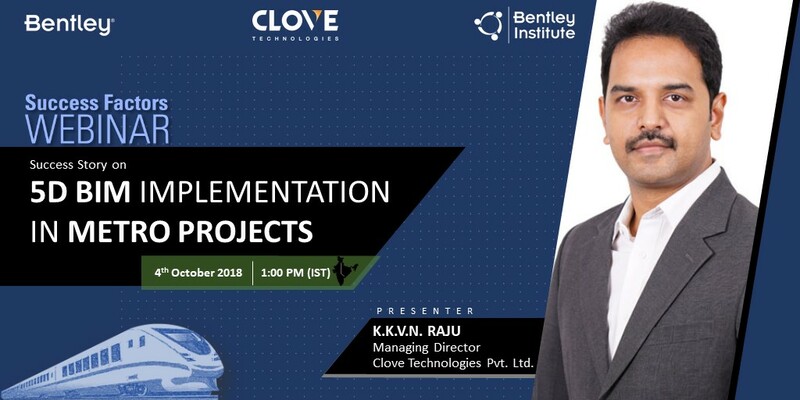 The world is about to be told the success story of Clove Technologies and how we played a vital role in digitizing the construction process of India’s 1st BIM-enabled Infrastructure development project, Nagpur Metro. With the help of Bentley’s vertical-specific solutions, we were able to aid the project stakeholders to improve visualization, control costs, time, quality and safety. The built environment community may anticipate some bankable advantages with this collaboration between the global leader of comprehensive software solutions and one of its kind Geo-BIM-Tech company. Clove Technologies has risen from its humble beginnings to undertake substantially massive projects and truly Accelerating Digital Engineering. The seminar is going to be a live video conference accessible to everyone that is registered. Register yourself for the Webinar today! The Webinar takes place on 4th October 2018 at 1:00 PM (IST).